Our trained professionals provide a comprehensive list of exterior and interior painting services to residential, commercial and industrial clients. Whether you need a full-house painting project or a decorative faux treatment in one room, Pro-Paint Plus, is the local business of choice. 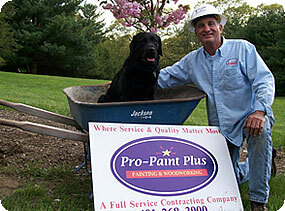 With over 25 years of house painting experience, we have the design skills to produce a tasteful and beautiful result. The Pro-Paint Plus difference is in our process. We don't cut corners. Removing old paint, often times, uncovers structural issues. The skilled craftsmen at Pro-Paint Plus, are capable of identifying and repairing structural problems, saving you time and money, while prolonging the life of your property. This is the added value, uniquely provided by Pro-Paint Plus! E-Barrier is a coating system we provide to our customers, who are looking to save on their energy costs. When E-Barrier is applied to the underside of the attic roof decking, it creates a barrier that reflects radiant energy, helping to prevent it from entering or leaving the building. E-Barrier reduces heating and cooling costs by as much as 15%, as certified by an independent heating laboratory. Our power washing techniques are very impressive to observe. We have practices that remove mold from concrete, blasting strokes that remove paint from steel, and passive strokes that remove dirt and grime from the softest woods, without any marking or damage. We also wash asphalt and slate roof, without standing on them, creating superior results. Consider us, when looking to remove mold from gutters, and really clean them out with our power washing practices. We provide steel coatings for everything, from steel buildings to statue grade finishes. We also provide long-term solutions for metal surfaces. Understanding that corrosion is the enemy of steel, we offer coating systems backed by the manufacturer for the life of all steel coating products. Painting Interiors take a lot of experience in interior reflective surfaces, to provide you with a superior finished room. How much sheen, level of preparation, and quality of coatings, is determined by the expert, and is stated in writing to the customer in professional form. The customer will know what to expect, and can request the quality they want, when interviewed. They will then know what to expect, and what the areas decorated will look like. We do provide color consultation at no cost, after signing of contracts. Our chemical paint stripping practices go back a long way. Removal of multiple layers of paint takes a craftsman with a lot of patience and knowledge; usually the wood at the base is old, and needs to be treated with caution, due to its soft nature, being of age, and usually great value. We remove all paint with a chemical, which is specially formulated to remove only the paint on the substrate. Window glazing is an art in its own form. Good glazing requires removal of old materials, which can be hard as rock. Usually, the glass it rests on is old, and the desired method is to keep it intact, and preserve it in the sash opening. We do have methods that will keep history intact, but understand it is labor intensive, usually an expensive procedure. If history must be preserved, we are very capable and assure success. The finishing process requires good linseed oil, glazing, and primers, topped by high quality paint to assure historical quality. When it comes to epoxy, we offer everything from garage floor coatings to industrial coatings for floors, pipe, and wet areas that are bullet proof. The manufacturer's specifications are signed and warranted to give lasting quality. We offer many examples of our work, and stand by our applications. We have a full array of faux finishes for marbleizing to graining, covering any substrate, to make the impossible look real. We specialize in ceilings and woodwork in the home, to full plaster finishes.